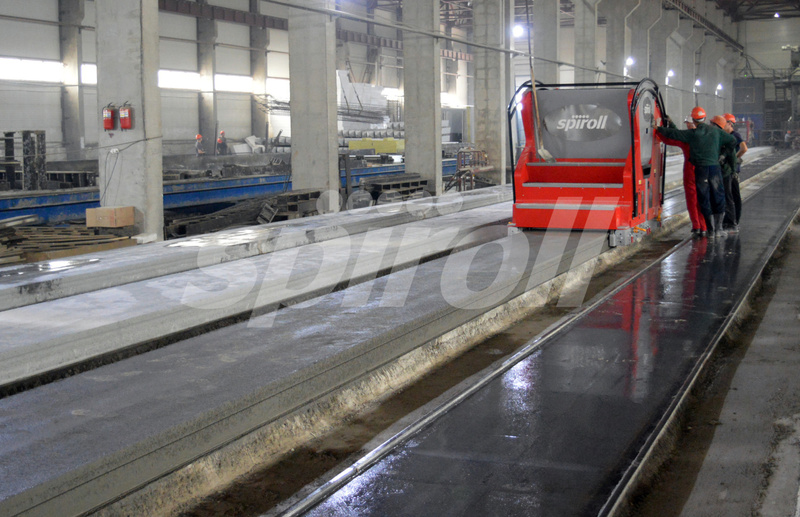 Discover more about the design, production and installation of prestressed hollow core slabs. The hollowcore production process begins with the drawing and design of a floor layout within a building. The usage of the building and loads applied will determine the depth, prestressed wire patterns and span of the slabs. The design is accomplished using 3D CAD software. This can then be translated into a production plan for the hollowcore factory. Any additional details, such as the insertion of lifting pins, cut-outs and narrow units are included. Production is accomplished by a team of factory operatives, and is often spread over multiple work shifts. Production planning is an important part of maximising efficiency and minimising waste of raw materials. 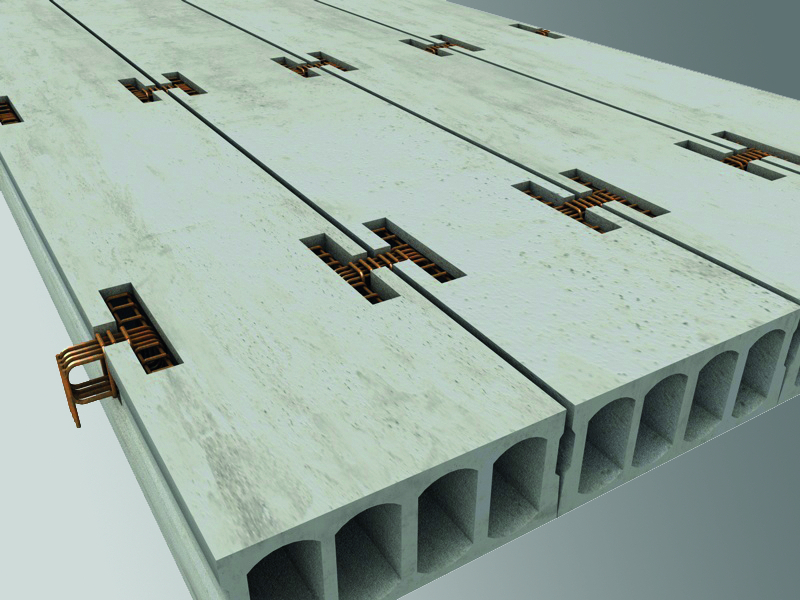 Hollowcore slabs are prestressed concrete elements. This means that they are reinforced by high strength, low relaxation steel wire or strand. The tendons are tensioned to a predetermined load prior to casting the slabs. Prestressing allows the hollowcore slabs to overcome concrete’s natural weakness in tension, facilitating longer spans between bearing points. The bond between the concrete and the prestressed tendons is crucial in the process. Due to the high forces involved, prestressing is a potentially dangerous operation, requiring strict health and safety procedures. It also requires specialist hydraulic equipment, either for single strand or multi-stressing. Once the concrete has been batched to the requirements of the casting machine, it is delivered via a distribution system. Casting machines typically fall into 3 categories: extruders, slipformers and flowformers. 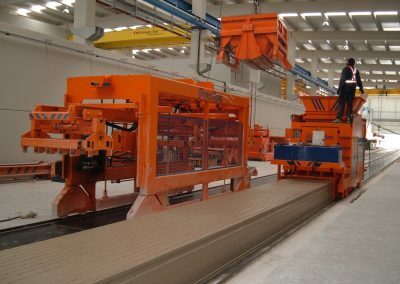 Casting machines run on steel beds/pallets, typically more than 100m in length. 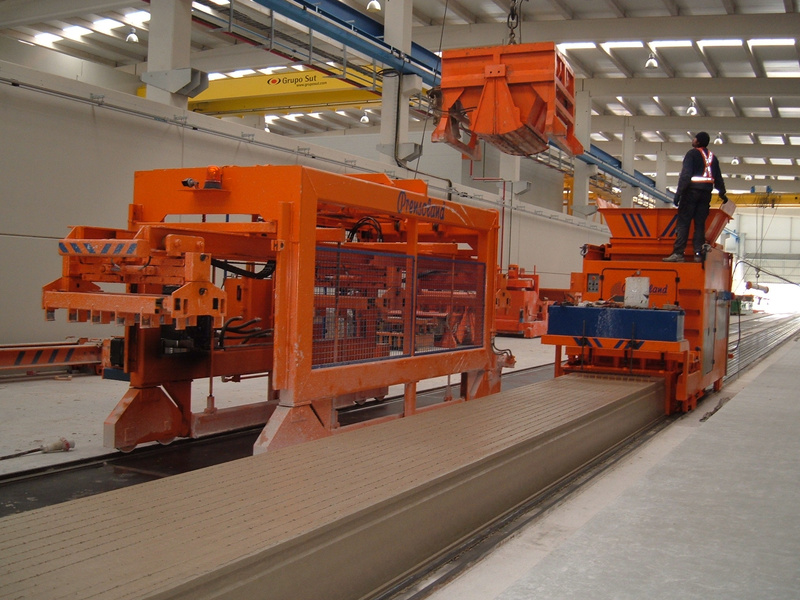 In addition to casting, there are various processes during hollowcore production that can be completed using machinery. 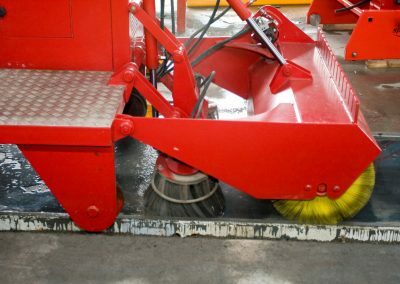 These can include: cleaning, oiling and wiring the beds, marking and detailing slabs, cutting slabs to required lengths, and equipment for lifting and stacking the finished product. Factories can range from labour intensive through to highly automated production. 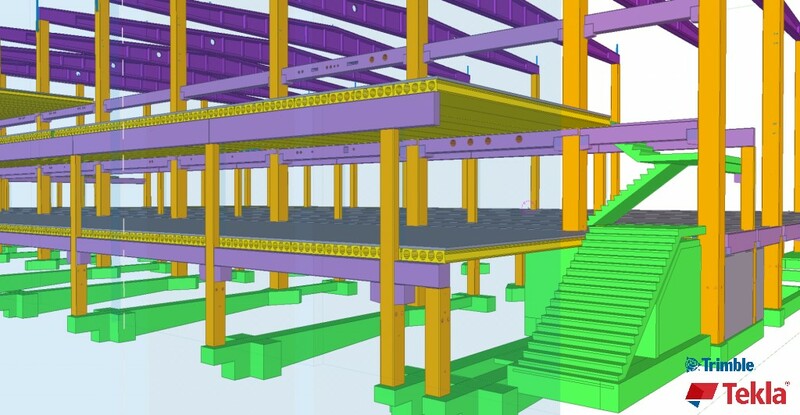 The floor layout of hollowcore slabs in a building is designed using 3D CAD software. 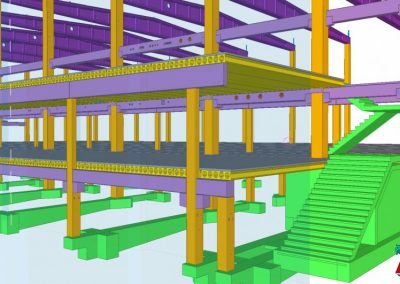 At this stage, design loads are used to calculate the depth and wire patterns of the slabs, depending on the spans required. This is then translated into a production plan for the factory to maximise efficiency and minimise waste. 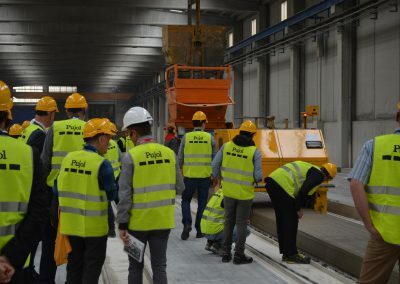 Production plans include information such as cutting slabs to length, and detailing requirements such as insertion of liftings pins, notches and exposed cores. 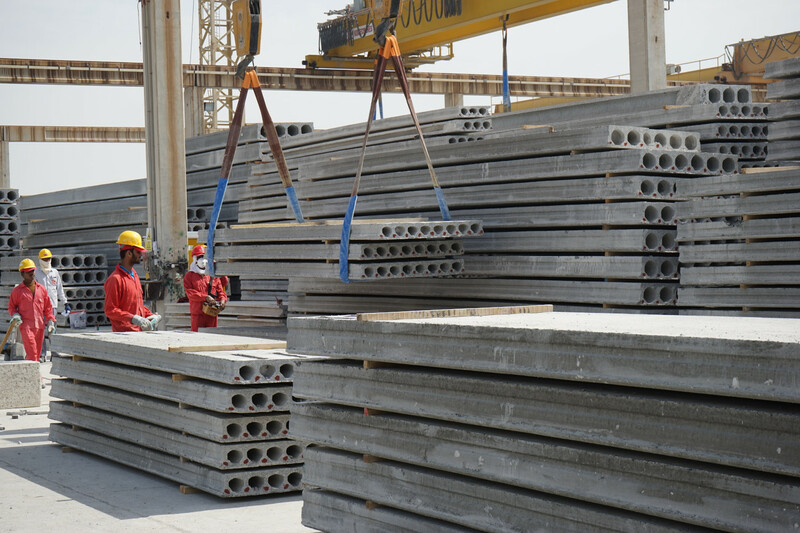 Hollowcore slabs are cast onto steel pallets or beds that are typically upwards of 100m in length. Prior to casting, there are a number of operations required in order to prepare them. They must be cleaned of any debris from previous casting cycles and sprayed with an oil release agent. This is typically carried out by a multi-purpose machine or bed cleaner. The prestressing tendons must then be run down the length of the bed in preparation for tensioning. Prestressing involves the application of load into the high- strength, low-relaxation tendons prior to casting. These are usually either single ply wire or multi-wire strand, ranging from 5mm-15mm in diameter. The tendons are tensioned either individually or all at once, which is known as multi-stressing. This is accomplished using hydraulic pumps and jacks/cylinders, with the tendons anchored on abutments at either end of the bed. Once the desired load is achieved (typically 70% of UTS), the tendons are locked into place. The concrete mix required to manufacture hollowcore slabs varies depending on the casting machine used. Planetary or twin-shaft mixers are typically used. High quality materials are desirable, and may be supplemented with additive (admix) chemicals. 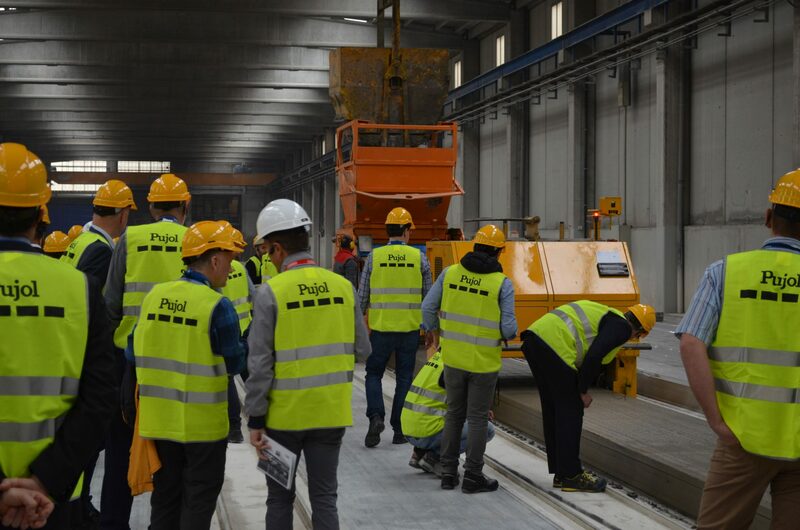 Once batched and mixed, the concrete may be delivered to the casting machine via a concrete skip using mobile plant, overhead or semi-portal cranes. Extruder – casts the slab using a dry mix with low cement content, and compacts the concrete with high frequency vibration. The build up of concrete and auger drive moves the extruder down the casting bed. 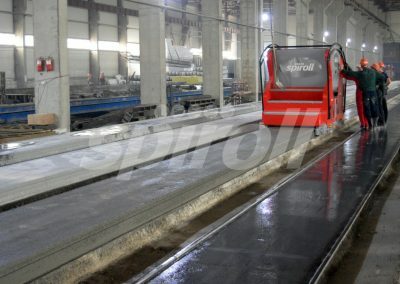 Slipformer – casts the slab in 2 or 3 stages, using a drive mechanism and vibration to form the slab around moving steel cores. They also have the flexibility to cast other elements that have a continuous profile. 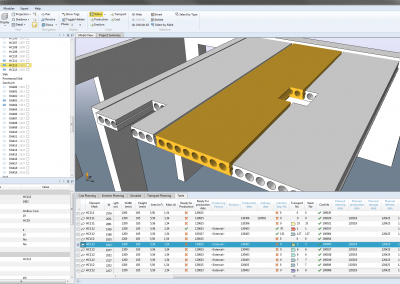 Flowformer – casts the concrete without mechanisms or drive units. The concrete flows by gravity and vibration. The process uses plastic quality concrete for versatility of cross section profile options with a smooth, rough or indented surface finish. 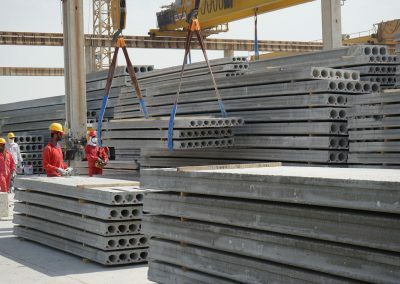 Hollowcore slabs often require additional detailing, such as openings, shelf-angles, narrow widths, and insertion of lifting pins. Some factories may use an automated Plotter – which is linked to the design/planning software – to accurately mark out these details and record data. 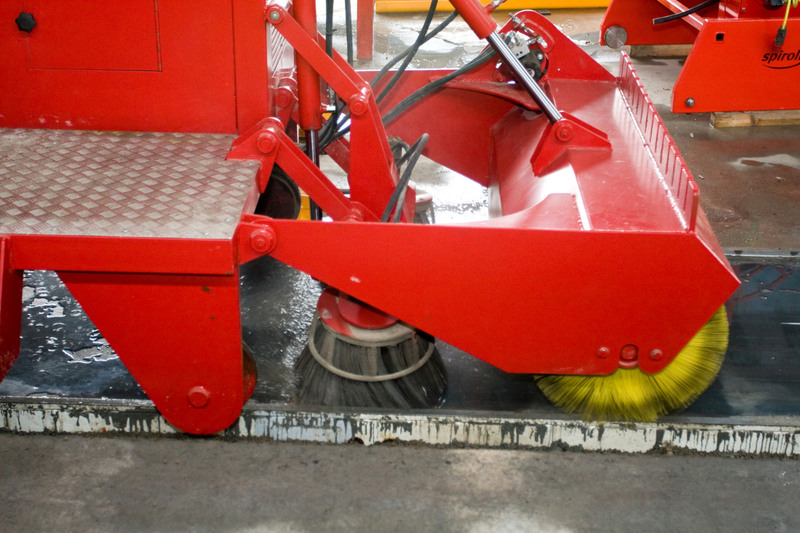 Vacuum suction machines/aspirators can be used to remove concrete and create openings. Wet cut saws are used to make longitudinal or ‘rip cuts’ in the fresh concrete. Once cast, insulated covers are normally used to assist with curing of the slabs, and to retain moisture. Additional water or steam heating under the casting beds may speed this process up further. 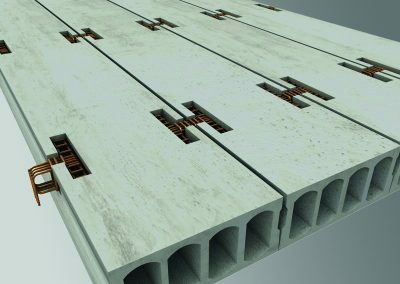 Once the appropriate strength has been reached, the concrete will have bonded effectively with the prestressed tendons. They can then be detensioned, capturing the prestressing load within the slab. 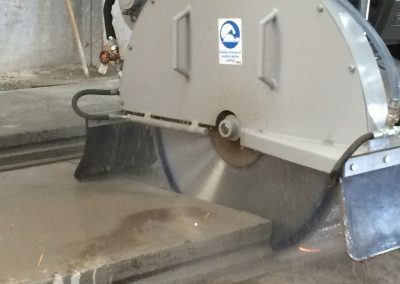 Saws are used to cut slabs to the correct length, and at different angles. Water is used to dampen the blade and reduce dust. Additional cutting stations can sometimes be utilised outside of the factory. Slabs are removed from the casting bed using clamps and lifting beams, in conjunction with cranes. Slabs may be removed from the factory on bogeys, using forklift trucks, or side loaders. They are stacked on timber bearers in the stockyard. 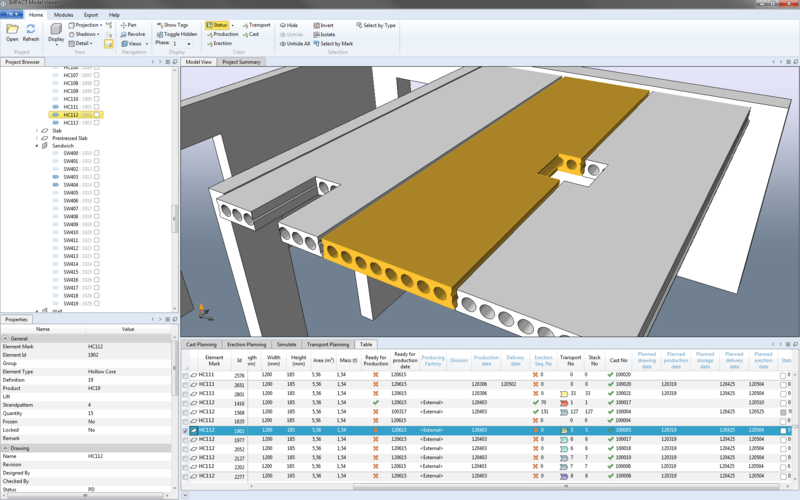 Traceability from design and production planning software is carried through to the stockyard, so that individual slabs can be identified. They are loaded onto trailers and delivered to site, where they can be installed using lifting clamps with spreader beams or chains. IPHA’s associate members include companies offering everything from 3D CAD design and production planning software, through to prestressing equipment, production machinery and lifting equipment. For more information on these companies, including their location and links to their websites, please visit our member directory page.